Match up the ends of one 12-inch length of green wire and one 12-inch length of copper wire. Fold the wires in half creating a loop in the center. Pass the loop through the drill hole on one green/brown/violet resin focal and pass the ends of the wire back through the looped wire creating a (lark's head knot) to secure the wire on the focal. Using a pair of chain-nose pliers, round-nose pliers and flush-cutters, wrap the four ends of wire around in two large (approximately 10mm) loops, then finish the ends with a wrapped loop (three to four wraps) around the wires above the focal. Using scissors, cut six 6-foot lengths of plum silk thread and two 6-foot lengths of dark green Mousetail cord. Match up one end of two 4-foot lengths of cooper wire, six 6-foot lengths of plum silk thread and two 6-foot lengths of dark green Mousetail cord. Tie an overhand knot at the end of the cords. Place the knot through the center of the Kumihimo disc, and place the strands through the slots on the disk making sure that the copper wires are in the center, the three red strands of plum silk thread are used as one cord on each side and two dark green cords are opposite of each other. Weave the cord in a basic 6 cord flat braid pattern until the braid is 15 inches in length. String the ends of the braid though a 6.5x6mm crimp tube. 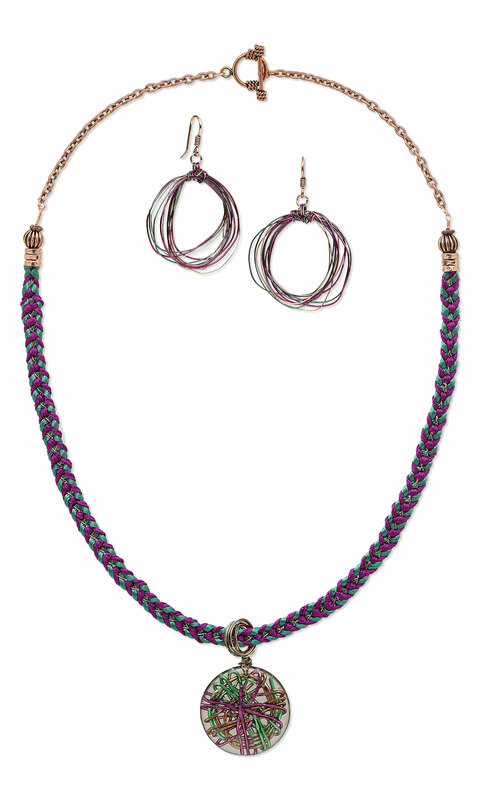 Place a small amount of E-6000® Jewelry and Craft Adhesive on the end of the woven cord. Using chain-nose pliers, crimp the center portion of the crimp tube. Cut all the cord except the copper wires flush with the end of the crimp tube. Remove the overhand knot from the first end of the woven cord. Repeat to attach a crimp tube, leaving the excess copper wire. Pass one 8mm corrugated round copper bead and one 4mm beaded rondelle copper bead onto the excess copper wire on one end of the woven cord. Using round-nose pliers create a loop 1/4 inch from the 4mm beaded rondelle bead leaving the excess wire. Using round-nose pliers, finish the straight end of the wire with a wrapped loop (approximately 8 - 10 wraps). Repeat to create a wrapped loop on the opposite end of the woven cord. String the focal piece onto the woven cord. Using a pair of chain-nose pliers and flat-nose pliers, open a 5mm jumpring. Pass it through the loop on the toggle ring portion of the clasp and the first link on one 3-inch length of chain. Close the jumpring. Open a 5mm jumpring pass it through the loop on one of the woven cord and the last link on the 3-inch length of chain. Close the jumpring. Repeat Steps 8 and 9, backwards, to create the opposite side of the necklace. Match up the ends of one 18-inch length of green wire, one 18-inch length of magenta wire and one 18-inch length of copper wire. Wrap the three wires around in three large (approximately 34mm loops). Then wrap the ends of the wires around the top of the looped wires covering the first ends for two tight wraps, one loose wrap creating a bail and two more tight wraps. Cut any excess wire flush with the wire loops. Using a pair of chain-nose pliers and flat-nose pliers, open a 5mm jumpring. Pass it through the bail on the top of the wrapped wire loops and the loop on an earwire. Close the jumpring. Repeat Steps 2 and 3 to create the second earring.